The band's record company has already registered the internet domain name nolineonthehorizon.com - a not-too-subtle clue that this will indeed be the new record's title. Among the songs to be released on what many music insiders are calling U2's best work to date are Moment Of Surrender, For Your Love, Love Is All We Have Left and One Bird. Earlier this week a 19-strong film crew headed to the Spanish city of Cadiz to shoot a video for the band's first single from the new album, although the band were not believed to be present. Last night an insider said the U2 machine is cranking up. "The album is more or less all in the bag except for a few minor details," the source said. "A lot of people have been waiting a long time for this album as they do with every U2 album." "But the word coming out is that the band is very, very happy with the end product, and when U2 are happy it should be quite a piece of work. They're not easy to please." 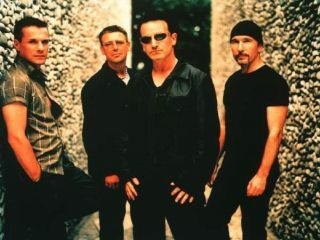 Legendary producer Steve Lillywhite, who has worked with U2 for more than two decades, said the new album had blown him away. No Line On The Horizon is the first original work since the band released the smash-hit How To Dismantle An Atomic Bomb in November 2004. That album went on to sell over 10 million copies and picked up eight Grammy Awards. But music commentators think the new record could scale even bigger heights for Bono, the Edge, Larry and Adam. U2 are also expected to announce details of a huge worldwide tour, which would almost certainly include a number of nights at the new O2 Arena in the Dublin Docklands - formerly known as the Point Theatre. In more recent U2 activity, the group have just re-released their first three albums - Boy, October and their 1983 breakthrough War - in extended formats and with previously unreleased tracks. However, a quantity of the re-released War albums were printed with incorrect track listings, making them instant collector's pieces.